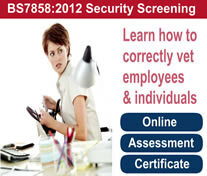 BS7858 2012 Security Screening & Vetting of individuals for employment – Code of practice Training Online. Why Obtaining The BS7858 2012 Is Important? It is essential to employ staff whose integrity and character are beyond doubt, particularly for positions of trust. The BS7858 2012 Security Screening & Vetting – code of practice enables Administrators and HR staff members, Directors, Business owners or individuals (looking to boost their CV) to confidently carry out pre-employment checks on new employees. or any business that wishes to protect themselves from potential employees who could be a cause for concern. Our BS7858 Security Screening Online Training enables designated members of staff to carry out the correct Pre Employment Checks on individuals and third party individuals. For those looking to follow the correct procedures when screening employees. Example: Those responsible for: Human resources/Recruiting, Administrators, Security, Finance, Compliance officers, auditors and insurance assessors, Construction, Care Workers, Individuals looking to boost CV. Why take the course Online? You can gain your BS 7858 Certificate of Completion online, at your own speed, in your own time. Our courses are convenient, cost effective and we also offer online support. Boost your CV by obtaining a BS 7858 Certificate through our self paced online course & certification and gain the neccessary skills to help fight against theft, fraud, terrorism or unscrupulous activities. The BS 7858 Certificate is recognised in a wide range of industries. Over 200 home care providers in the UK have been found to be using staff without vetting them properly, according to the BBC’s “Inside Out” programme. Firms are failing to carry out necessary background checks before employing individuals as care workers, neglecting to make sure that personnel were not barred by relevant professional bodies and omitting criminal checks. The Care Quality Commission, which regulates home care within England, regards the workers as improperly qualified, a Freedom of Information request revealed. However, care minister Norman Lamb stated this did not demonstrate that “the whole system” of around 6000 operators had failed. Standards The 2008 Health and Social Care Act lays out standards for homecare providers. The Care Quality Commission (CQC) gives care operators guidance on these standards and how to comply with them. The CQC requires that home care workers are subjected to effective vetting procedures during the recruitment process and that home care providers institute appropriate selection procedures. Companies must also ensure that their staff are registered with the appropriate professional regulators and that staff who may no longer be fit to work are referred. Risk The commission told BBC investigators that its inspectors had uncovered 217 home care providers employing staff without ensuring that they were adequately qualified and vetted. Individuals with criminal records who had not been risk-assessed were also found to be engaged in home care work. The CQC instructs care providers that workers who may pose an additional risk to those in their care – such as those with a criminal conviction – should be risk-assessed to make sure that they are not a threat. The age and relevance of a criminal conviction should be considered, along with the roles that a person is likely to undertake and the needs of service users. “Disturbing” The care minister said that the findings were “deeply disturbing” and affirmed the need for care providers to be held to account. However, he stated that the failings of individual care home providers did not indicate a system-wide failure. Birmingham and Solihull coroner Aiden Cotter called for the introduction of independent monitoring boards to protect service users. With the UK economy currently in limbo and inflation set to rise to it’s highest level ever, there is a chance that employee fraud will increase as pockets tighten. Employers should ensure they have procedures in place to handle fraud should it arise. Question: What initial steps should be taken if an employee is suspected of fraud? Answer: One of the main priority for the organisation should be to secure its assets and prevent any further losses. Suspend any signing authorities or bank mandates. This step usually involve suspending the ‘alleged’ wrongdoers while investigation takes place. Finally ensure your secure any important evidence you might have. Suspend any routine destruction of documents and to retrieve and secure electronic data. In serious cases, forensic computer experts may be called in to ensure that electronic data is secured or retrieved safely. It may also be necessary to make insurance notifications and, where appropriate, to notify regulators or make a market announcement. Question: Should the employee always be suspended? Answer: As long as there’s reasonable grounds to suspect that fraud has taken place then a suspension is usually the most appropriate course of action, depending upon contractual term permitting suspension. If the suspect has access to computers or other records that may be altered or destroyed and there is a risk that the wrongdoing will continue, then suspension will be essential. The employer needs to consider whether the investigation could continue with the ‘alleged’ wrongdoer in the office. It may be difficult to later argue that the employee’s conduct was sufficiently serious to justify a dismissal for gross misconduct, if the organisation fails to suspend an individual. If the organisation is regulated by the Financial Services Authority (FSA) and there is concern that the individual is not behaving in a fit and proper manner then there will be an expectation from the FSA that the employee be suspended. Question: At what stage should the police be brought in? Answer: Where there is a suspicion that money laundering has taken place, an employer is under a duty to involve the police. Otherwise, it is the employers discretion whether to report the crime. However there may be insurance or regulatory obligations that require any wrongdoing be reported. The police have greater powers to interview witnesses and seize evidence maybe more cost effective than applying to the civil courts for injunctions. Before the police can act, the crime must be reported to a local police station to obtain a crime reference number. Getting the police involved sends a strong message to other potential wrongdoers. This will mean that the organisation may lose control over the investigation process and could increase the chance of publicity. It may also cause delay to any civil proceedings to recover any lost assets. Question: Should such employees be paid to go away? Answer: If there is strong evidence the employee has committed fraud and the statutory dismissal and disciplinary procedure is complied and the employer can be confident that any dismissal will be upheld as fair then there is no need to simply pay the employee to go away. Question: What rights does a suspended employee have? Answer: The employment contract should always be checked to determine exactly what rights an employee suspended for fraud will have. However, while they are suspended they usually enjoy their normal contractual rights, eg, to be paid, and will have all the statutory employment rights that any other employee enjoys. Question: What should be done, legally to minimise the risk of fraud? Answer: Employers should ensure that all employment contracts and the staff handbook contains appropriate restrictions so as to minimise the potential for employees to carry out fraud. For example, ensuring that employees take at least one 10-day holiday a year can be a useful way to detect fraud. A fraudster might be able to cover up their activities for short absences but a longer absence is more likely to reveal what they have been doing. Employers should ensure proper procedures are in place so as to minimise the risk of fraud and employees are given appropriate training on these procedures. Employees should be encouraged to report any colleagues who are committing fraud. When recruiting, ensure your vetting process is carried out to the BS7858 Security Screening & Vetting standard. This safe guards you in the unfortunate results of employee crime especially if the alleged crime affects your clients information and relationship. Question: Can an employer tell a suspected employee to clear their desk and leave immediately? Answer: An employer can usually suspend an employee they suspect of having committed a serious breach of their contract and can require them to leave the building immediately. However, to dismiss them it will be necessary to apply the statutory dismissal procedure so as to avoid any claim for automatic unfair dismissal. Internal fraud in financial institutions appears to be a growing problem. There have been a number of cases in which individuals working for financial services firms have been coerced into providing information on customers to outsiders who have then used the information to commit fraud. Alternatively the fraud may be initiated by staff themselves and there have been a number of well publicised instances of this in recent months. Cases such as these highlight the importance of firms ensuring that they have adequate checks in place as part of their recruitment processes and also have systems to discover potentially suspicious activity on the part of their employees. Insurer Norwich Union confirmed that it had instituted legal action against a member of staff in the wake of a £1.5m employee fraud believed to have originated in one of the company’s claims departments. Some £3 billion in the UK go through the company’s claims offices, based at several locations in the UK, every year. No other members of staff are thought to have been involved. A number of UK insurers have been the victims of employee misbehaviour in recent years. Several members of staff at Legal & General were fired after irregular dealings in tax-free individual savings accounts were uncovered in 2001. Earlier that year City of London Police made a number of arrests at Prudential’s head office in connection with a conspiracy to defraud the company.